Halifax B. Mk. 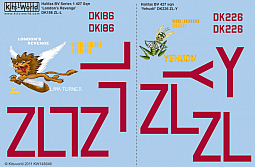 V. 'London's Revenge' serial DK186, ZL-L, was painted with Nose Art featuring the M.G.M. [Winged] Lion flying while holding a bomb between the paws. 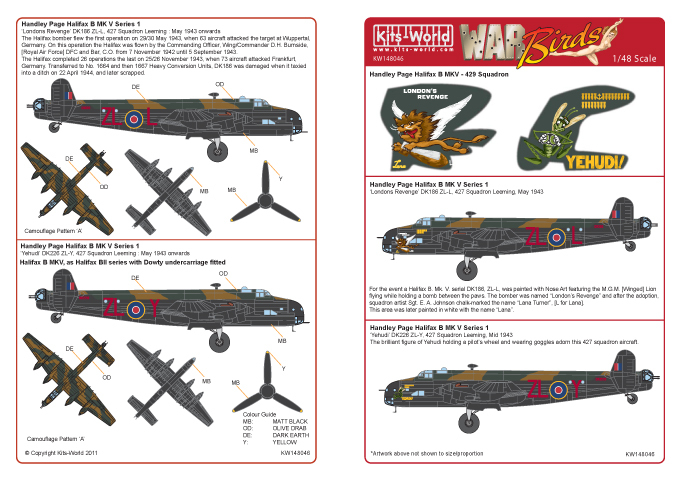 The bomber was named London's Revenge" and after the adoption, squadron artist Sgt. E. A. Johnson chalk-marked the name Lana Turner", [L for Lana]. This area was later painted in white with the name Lana". London's Revenge flew the first operation on 29/30 May 1943, when 63 aircraft attacked the target at Wuppertal, Germany. On this operation the Halifax was flown by the Commanding Officer, Wing/Commander D.H. Burnside, [Royal Air Force] DFC and Bar, C.O. from 7 November 1942 until 5 September 1943. 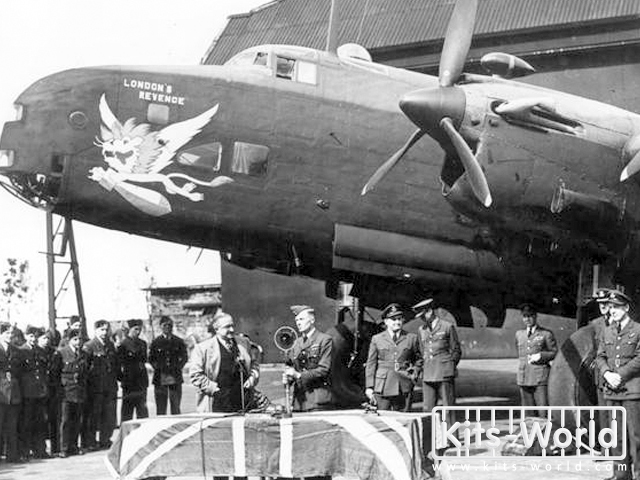 The Halifax completed 26 operations the last on 25/26 November 1943, when 73 aircraft attacked Frankfurt, Germany. Transferred to No. 1664 and then 1667 Heavy Conversion Units, DK186 was damaged when it taxied into a ditch on 22 April 1944, and later scrapped. Halifax B Mk II Series 1 (Special) 'Medicine Hat' JD1I4, VR-O, of 419 (Moose) Squadron after 45 bombing raids (one carrying an aerial mine) and pictured at Middleton St George in mid-1943 In November 1942, 419 (Moose) Sqn began conversion from the Wellington Mk III to the new Halifax B Mk II. 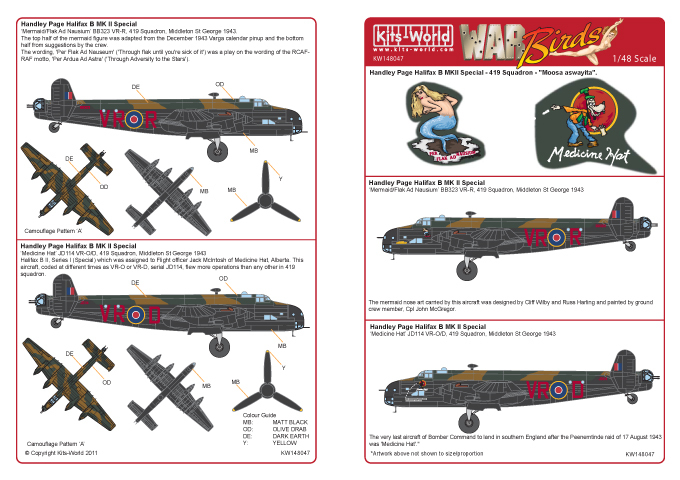 In May 1943, the squadron, based at Middleton St.George, Durham, received a brand new Halifax B II, Series I (Special) which was assigned to FlO Jack McIntosh of Medicine Hat, Alberta. 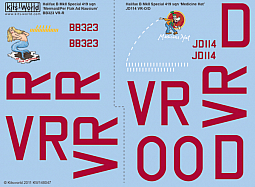 This aircraft, coded at different times as VR-O or VR-D, serial JD114, flew more operations than any other in 419 squadron. 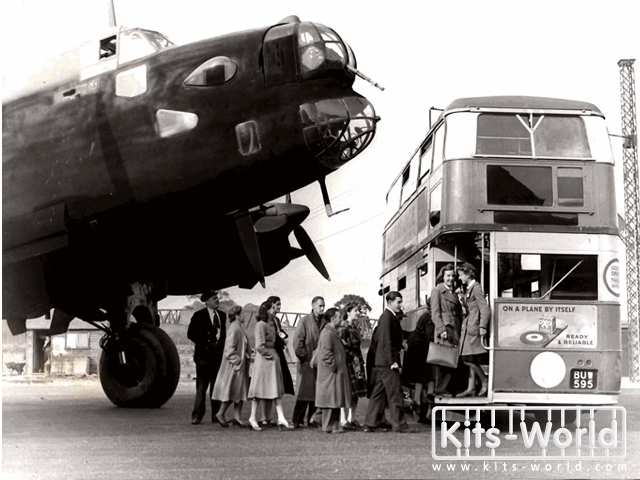 In April 1943, Edmonton born Sgt Pilot Bill Gray and his crew received a new Halifax B Mk II (Special), coded VR-R, serial BB323, which they first flew on their sixteenth operation and for the remaining trips of their tour which they completed in June 1943. 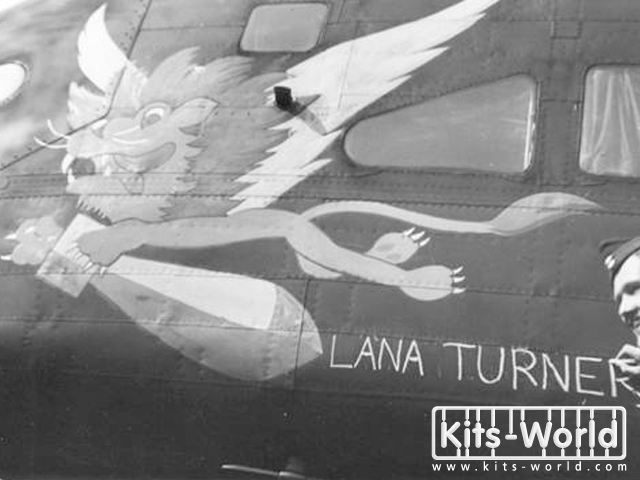 The mermaid nose art carried by this aircraft was designed by Cliff Wilby and Russ Harling and painted by ground crew member, Cpl John McGregor. The top half of the mermaid figure was adapted from the December 1943 Varga calendar pinup and the bottom half from suggestions by the crew. RAF motto, 'Per Ardua Ad Astra' ('Through Adversity to the Stars').